We are holding quarterly Live Bidding Auctions of Rare Worldwide Stamps and Postal History. Our Company specializes in Russian stamps and covers of all historical periods and regions, including philatelic material of Armenia, Azerbaijan, Baltic States, Georgia, Russian Finland, Poland, Tannu Tuva, Ukraine. We provide professional expert opinion, appraisal and consultation regarding Russian Imperial stamps, including Zemstvo, as well as RSFSR, Soviet Union stamps and postal history. Our Philatelic Auction features approximately 1500 individual lots and collections, including comprehensive and specialized Russian stamps and postal history, elusive British Commonwealth stamps, wide selection of Asian philatelic material, nice quality stamps and covers from Eastern and Western European countries, worldwide Zeppelin and Pioneer Flights covers and cards. Our Auction #81 will be held on March 21 - 23, 2019. The Sale contains 1469 lots of Rare Worldwide Stamps and Postal History of the World and represents the property of 53 owners. - Over two hundred Collections, Accumulations and Selections. Detailed description of the Current Auction can be found in About Auction section. This section consists all necessary information about our current Auction, including Conditions of Sale, Auction Schedule, Bidding Process and Methods of Payment. 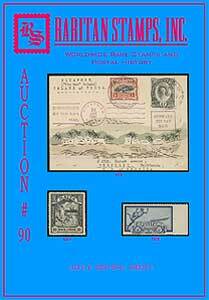 Prices Realized and Catalogues of the past several Stamp Auctions are posted in this section as well. Current Auction Catalogue with the detailed lot descriptions, full color images and current bids is in CURRENT CATALOGUE section. THE LIVE BIDDING AUCTION takes place in our North Brunswick office, New Jersey. We provide real-time bidding process on several telephone lines and Internet simultaneously. If you wish to participate in our Live Auction by Internet, please CLICK HERE for details. If you prefer to bid via telephone please CONTACT US in advance. You can enter the Live Auction only the day and time when it takes place. Live Bidding Auction #81 will be held on March 21-23, 2019. All other times please refer to the ABOUT AUCTION section. We always accept worldwide collections, accumulations, single rare stamps and postal history for consignment. All we take is 10% sales commission. No charges for unsold lots. Prompt settlement and interest-free advance payment up to 50% of Estimate. If you would like to get more information please refer Sell with us section. Make an addition to your stamp collection right now using our PRICE LISTS section. There are Price Lists of Russian and Soviet Union Stamps of 1858-1991, North Korean of 1946-90 and Vietnamese Stamps of 1951-95. Click here to make a STAMP ORDER. Our Company was established in January 1998. For more than ten years we have been the worldwide leading dealers in Russian stamps and postal history. Philatelic professionals of Raritan Stamps, Inc. are ASDA, APS, NSDA, IFSDA, Rossica, BSRP, UPNS members in good standing. The more detailed information about our Company you can find in ABOUT US section. If you would like to participate in our Stamp Auctions and receive a complimentary copy of our current catalogue, please REGISTER HERE. submit or correct your personal information in secure mode at MY ACCOUNT Section.